Key Difference: In general usage, the terms are interchangeably with shrimp referring to small ones of the species and prawns referring to the larger ones. However, scientifically they are classified differently. Shrimp belong to the Pleocyemata sub-order, while prawns are classified into the Dendrobranchiata sub-order. Shrimp and prawns are often confused and used interchangeably specifically in cooking. This is quite common as shrimp and prawns are quite similar in looks; however, they differ from each other biologically. An unjust distinction is made in terms of size, where small ones are known as shrimp, while larger ones are referred to as prawns. Although, this is used for unofficial differentiation, it is wrong. Many shrimps are wrongly considered as prawns, while many prawns are considered as shrimp. So, what’s the actual difference? Let’s understand the similarities first. Both shrimps and prawns are used to refer to decapod crustaceans that are found in salt water as well as fresh water. The term ‘decapod crustaceans’ refers to the creatures having an exoskeleton and 10 legs. Both of these creatures are found near the ocean floor in search of food. While, many people claim that there is very slight to no difference in how they taste, many cooks state they taste completely different. According to cookthink.com, prawns have a more “sweet, succulent meat” on it, rather than shrimps. However, in many culinary recipes, shrimp and prawns can be substituted for each other. Shrimp and prawns are both classified scientifically as decapod crustaceans, but belong to different sub-orders. 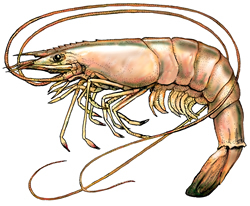 Shrimp is further classified into the Pleocyemata sub-order, while prawn is classified into the Dendrobranchiata sub-order. Prawns and shrimp also differ in terms of gill structure, pincers, leg structure and reproduction. In terms of gill structure, prawns have branching gills, while shrimps have lamellar gills, which have a more plate-like feature. Shrimp have shorter legs and have claws only on two pairs of legs, while prawns have longer legs and have claws on three pairs of their legs. 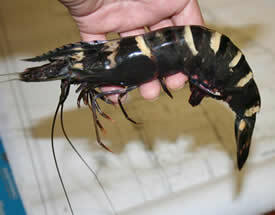 Shrimp’s front pincers are usually the largest; however, in prawns the second pincers are larger. The main difference lies in how they reproduce. Shrimps carry their eggs and are present during the entire breeding season, while prawns lay their eggs and leave it to develop on their own. However, in many countries there is absolutely no difference other than the size. Prawns and shrimp are grouped in the same group, with the larger ones being referred to as prawns, while the smaller ones are referred to as shrimp. Hence, the term ‘jumbo shrimp’ is considered as an oxymoron. According to the crustacean taxonomist, Tin-Yam Chan, "The terms, shrimp and prawn, have no definite reference to any known taxonomic groups. Although the term shrimp is sometimes applied to smaller species, while prawn is more often used for larger forms, there is no clear distinction between both terms and their usage is often confused or even reverse in different countries or regions." Shrimp is used to refer to small ones from any of the species. Prawn is used to refer to larger size creatures from both species. Shrimp originated around the 14th century with the Middle English ‘shrimpe’ meaning “contract or wrinkle.” It is unsure how it became referred to as small. Origination is unclear, but early forms of the word include words such as ‘prayne’, ‘praine’ and ‘prane’. Shrimp are generally smaller than prawns. Prawns are typically larger than shrimps. The front pincers are the largest. The second pair of pincers are the largest. Shorter legs compared to prawns. Longer legs compared to prawns. White leg shrimp, Atlantic white shrimp, Pink, Dotted and Brown shrimp. Indian prawn, Giant river prawn and Tiger prawn.